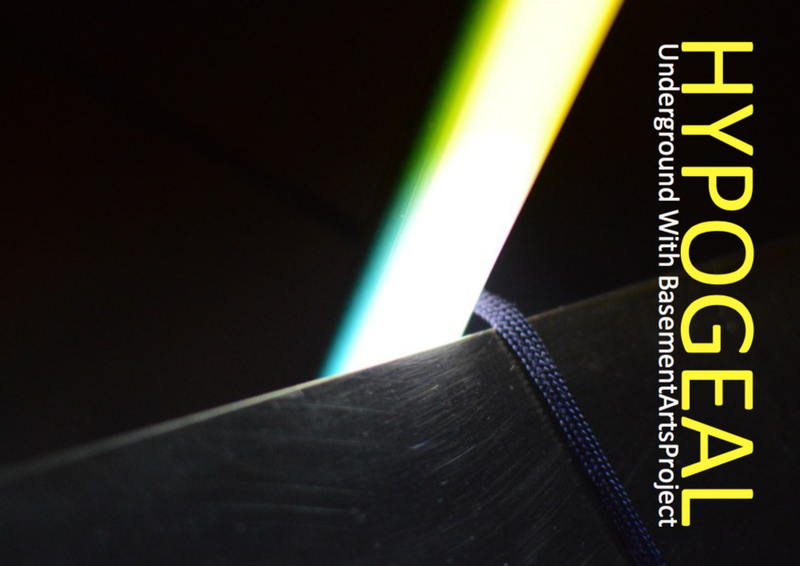 BasementArtsProject is an artist-led initiative, located in a pre-war, mid-terrace house in South Leeds, facilitating and promoting the activities of artists nationally and internationally whilst maintaining a broad and varied programme within the city of Leeds. For this exhibition Hopkinson presented work made over a period of nine years that looks at two very distinct strands of research; on the one hand ‘Closest Packing Theory’ and on the other the use of computational models in order to subvert the reality of what is possible in three dimensions. In materials ranging through three types of stone; Ancaster and Portland stone and Carrara Marble, and cast objects in Plaster and bronze Hopkinson’s work takes us into a realm of theoretical mathematics, numbers whose accuracy is dictated by the fact that they run on into infinity. These numbers are the building blocks of most design and are ultimately instrumental in our own understanding of beauty. There are three sequences of numbers that are central to the understanding of this exhibition. One of these being the fibonacci sequence in which, beginning at zero, each number added to the previous one gives the next number in the sequence, therefore . . . 0, 1, 2, 3, 5, 8, 13, 21, 52, 73 ad infinitum. The other two are single numbers whose nature is irrational, by which we mean they have no end due to the how the numbers occur beyond the decimal place. These numbers are Pi – 3.141… and Phi – 1.618… and on and on. Of these three it is Phi that has the largest bearing on the sculptures being presented. Phi, represented as φ, and also known as the Golden Ratio, Golden Mean or Golden Section is an important factor that is forever recurring, just like its number, in art and architecture. Whether it is the method used to define the organisation of elements in a building, the dimensions of a picture frame or television screen or even the construction of the picture itself, Phi is instrumental. It is the organisation of these numbers and how they translate in the real world as structures and angles that defines the nature of much that we look at such as the organisation of branches and leaves on trees, seed arrangements in plants and flowers, pine cones, segments of a pineapple and on and on . . . A process known as Phyllotaxis. Nature, it turns out, is an extremely efficient organiser of space, wanting only to get the most out of existence. So in the finely tuned angles between the occurrences of branches on a tree we discover that this process is no accident, nor is it random, in fact it is designed to allow maximum efficiency in the gathering of sunlight as the tree grows. It is the subject of such efficiency that the largest number of sculptures in this exhibition explore. 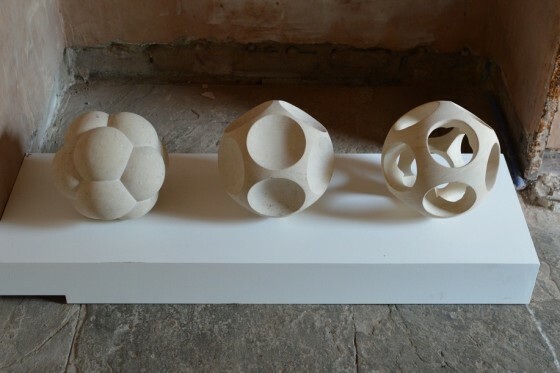 Using both casting and direct carving techniques Hopkinson’s work looks at ‘Closest Packing Theory’ and how spheres pack in three dimensional space most efficiently. 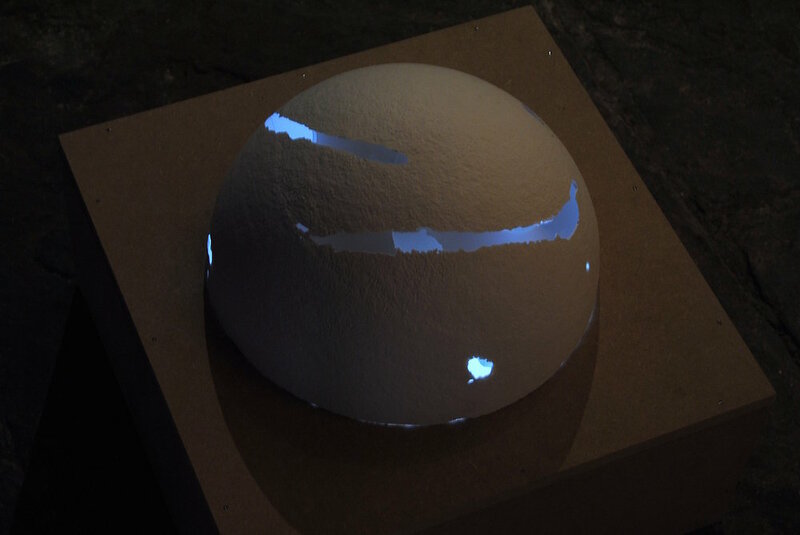 In one series of cast works we are able to look inside a single sphere to see a delicate lattice, formed by the plaster between the hollow spaces that would have been occupied by other spheres. The web is so delicate in places that one can understand, purely by looking at it, the difficulties inherent in casting such an object. In another cast series solid objects have been created and placed in a structure by which they are confined. Here the objects settle and their forms distort removing the maximum amount of dead space possible. In the bronze cast pieces and stone carved works that follow this theme we are instead asked to consider the spaces between by showing us the exterior of the spheres as they are packed together in their most efficient manner. The second series of objects in this exhibition are based on a branch of mathematics known as Topology in which shapes are distorted, twisted, stretched and deformed whilst the original properties of the object are preserved, therefore the tearing or puncturing of surfaces is not permitted. In this sequence of sculptures a sphere is distorted to the point of being turned inside out. In the world of 3 dimensions this is quite obviously impossible, but in the virtual world it is not and here Hopkinson presents a series of sculptures that represent individual points on the journey from inside to outside / outside to inside. The physicality of these sculptures in stone and bronze culled from forms created in virtual space, are a weighty counterpoint to the fragile nature of the plaster forms that originate in the real world. Elsewhere in the front exhibition space the work entitled ‘Kissing Isaac Newton’ (2011) has for a number of years been gathering a patina in Hopkinson’s garden, giving it a certain quality that none of the other works on display at Basement have. Whilst this particular sculpture in Ancaster Stone still has the accuracy and attention to detail that all of his work has, the effect of environmental factors has altered the colour and texture of the piece. As it sits here in the warm glow of the evening sunlight it seems to merge with the wall behind it, the shadows and colours blend the contours of the work with the crumbling painted plaster and stone of the backdrop; from certain angles the piece appears to be emerging, rough-hewn from the very fabric of Basement. From old discoveries new pathways emerge and here the presentation of this piece seems analogous to the whole raison d’etre of Dominic Hopkinson. “Between thought and expression lie a lifetime” wrote Lou Reed back in 1969, a consideration of the effect that time and experience has upon the reality of things that initially begin as a thought. Similarly between Isaac Newton and Lara Favaretto lie many lifetimes but the principle is the same. In ‘Kissing Isaac Newton’ we see the cumulative effect of time, gathering presence and exerting its influence on an artwork that occupies a particular moment in the development of an idea, a moment in which idea is made manifest. Four years later and this particular piece is simultaneously disappearing into and emerging from its surroundings. A discovery made, an idea explicated and then an idea accepted before we are confident to move on to the next stage. At the other end of this trajectory is ‘Doing Evolution after Lara Favaretto’ (2015) similarly detailed, yet similarly rough-hewn, only this time due to it’s possible status as a work in progress. So why include a work that is unfinished? Well, life is a journey and some questions are meant to remain unanswered. If certain questions were answered I believe that we would negate the reasons for our own existence. Nature evolves, we evolve and so to do our discoveries and desires. Art does not exist to make the possibilities of the universe finite but rather to extend them and keep us pushing forward. ‘A Harmony Of Spheres’ was always conceived as the first step in a project that would, god and / or nature willing, develop into a more site specific exploration of Hopkinson’s practice. It is now that those discussions, the whys and wherefores, must begin as we start to re-evaluate the ideas that were put to one side for this show and how a trajectory could be mapped out to guide the development of an exhibition for 2016. This talk is a tour of the irrational from Plato to Buckminster-Fuller and it is going to be dealing with the influence of Phi, which for those in the art world is known as the golden ratio, the golden mean, or the golden section. It’s fundamentally the relationship of two different numbers but we’ll come to that. Now, there’s a geologist, there’s a physical chemist, or a chemical physicist, I always get it the wrong way round, here today and I’m gonna fess up to everybody else that I’m not a mathematician and I’m not a scientist, I’m just fascinated in those realms as a kind of creative process and I’m interested in how the crossover of the ideas that mathematicians and scientists work with function, and, at a sort of, an aesthetic level, a level of making. I’m fortunate enough to work with Ben, (indicates a person in the room, Professor Ben Whitacker, University of Leeds) at the university and various other people, Andy, (indicates a person in the room, Andy Wilson)on a project called ‘The Superposition’ which is basically a sort of collision of different disciplines doing interesting things, preferably dangerously. And then we show and exhibit, but this is kind of my private work, and is what has led me, to that point of being able to work collaboratively with scientists. So, going back to Phi, rather than Pi, and it’s written like that (illustrates on board), it’s an irrational number which basically means that it’s numbers after it’s decimal place just keep going. It can’t be defined as an accurate fraction. So it’s equal to 1.61803389887… and that means that it carries on to infinity and beyond . . .
Now Phi is named after Phideus who was a Greek sculptor, and it expresses itself in harmonics as a ratio of two parts to the whole. 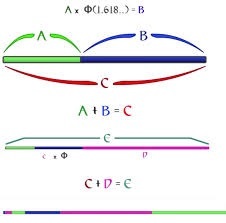 (Drawsdiagram on board) So we start with a line C that is divided into two parts A and B such that A x phi (1.1618) is equal to B. And that is the fundamental relationship that creates this number. This is manifested in western culture in many ways today, from the shape of, for example, windows, television sets, classical paintings, so as an artist I first discovered this number because we are taught about it in art history as being the perfect ratio of a picture frame, whether it’s landscape of portrait. Because the side of the vertical versus it’s horizontal is this ratio. In theory! Now it’s very rare that they ever are but that’s how we’re taught about it in Art College. And it works as fundamentally the same process in music as well, so the fact that the relationship of notes are as half, a third, a fifth, an eighth those numbers all function as a ratio of this number and this harmonic frequency. We are talking about Phi. It sounds more complicated than it really is. But it’s a number that fascinates me because it is absolutely everywhere and it crops up in so much of mathematics and science, whether it’s biology, chemistry, physics but it’s also embedded in the natural world. I am also fascinated in something which are called Platonic solids which is where we get to the first of our Characters, Plato. Platonic solids are objects that occupy three dimensional space that fit inside a sphere, it’s apexes don’t protrude past the surface of the sphere, it’s sides are all equal, and it’s faces are equal. The smallest known Platonic solid is a tetrahedron, which is made up of four identical triangular faces and if this was a wire mesh all of its edges would all be equal, and its faces are equal. And then the obvious one’s a cube, it’s got six regular square sides, all its edges are all equal and the point of a platonic solid is that it fits inside of a sphere so that, this point, this point, this point and this point all touch the inside of the sphere and they do not extend outside of it. And that is the rules for Platonic solids, that they have to have equal faces, equal edges and sit inside a sphere without expanding past it. Now having described those there are only five Platonic solids, forget all of the computer technology we’ve got, there are no other Platonic solids than those five. And I find that amazing. And I find it particularly amazing that Plato worked all that out thousands of years ago and defined them as being the only solids that would do that. And so the smallest one is the tetrahedron, then we go to the cube, then that’s an octahedron, the dodecahedron and then we have an Icosahedron. So the dodecahedron is a twelve-faced object, which is what this piece of work is based on, so there are twelve holes, there are twelve concavities, there are twelve bulges and they fit in space. And that’s what I’m interested in. The Greeks also gave them elemental properties so the tetrahedron was basically fire, the cube was basically earth, octahedron – air, dodecahedron was the universe and the icosahedron – water. And Kepler in the 16th Century linked nested versions of these to the structure of the universe so that they were then linked to the trajectories of planets, the orbits of moons and things like that so there is a direct link at this level to trying to use geometry to explain virtually everything. Which is kind of amusing now but there’s a certain amount of relevancy to some of it. Each of the five Platonic solids can be built in what is called closest packing, and closest packing is literally just that, it’s how spheres fit in space, pack in space. There are different ways to pack spheres in space and the mathematics of this is used to calculate the most efficient packing systems. The mathematics of the closest packing theory is quite fascinating as this brings us to our second of our two protagonists which is Buckminster-Fuller. He was a polymath, he was an architect, a designer, an artist, a teacher but he is probably most famous for his work in the 1950’s when he created the ability to build what are known as geodesic domes. A geodesic dome for those of you who don’t know is the Eden Project down in Cornwall and the big plastic rooves that are created, they’re geodesic domes and they are based on his research for closest packing. And so the mathematics of building those sorts of domes are totally about closest packing theory. What he discovered was that you can generate these curved dome shapes are self forming because of the way spheres pack in space and if you look at the little pieces of plaster work at the back on the floor in there, that expresses the same process as the way as the geodesic dome works. And what he discovered was that the maths builds a hexagonal sheet, the exact same mathematics that Bee’s use to make their honeycombs. The packing means you have one central one and it’s surrounded such that you get a hexagon. And the hexagon builds next to it, and the way that the Bees build their honeycombs is actually they build a whole series of tubes, put them next to each other and then they push the corners out to each until they become hexagons. So they are not wasting any space, there is no void space between the tubes anymore. And so that builds a flat two dimensional lattice, and what Buckminster-Fuller realized is you can actually break some of those hexagons, turn them into pentagons that then actually cause the flat lattice to then dome. So if you look carefully at the geodesic dome you can count x number of hexagons and every now and then there will be a pentagon. And that was enough to curve it. And he worked out that it doesn’t matter what size lattice you work with, if you’ve got 50,000 hexagons in your lattice you only need to break 12 of them and it will actually come into a complete sphere, so there’s a very explicit piece of mathematics that’s going on there. Now for me closest packing is really important in the way that it crosses over with so many, things because the plaster pieces in the other room, for example, are based on the idea that they are about how cells replicate, how they pack in space. For me, I think of cells as deformed or bastardized spheres that actually occupy a three dimensional space, they have to pack in that three dimensional space and so nature does that most efficiently and closest packing theory is mathematically the most efficient way of doing that. So what that tends to do is they pack in a very particular way, the closest packing also generates a twist in the way that they pack and that’s called the generative spiral so all the growth tips of plants have this generative spiral which means that it is created out of the way that the first few cells in the growth tip are packing together and it twists and that creates something that we know as phyllotaxis, which is Greek for leaf arrangement and so it causes twisting in the plants. If you look at a pinecone, pineapple, the packing of a seed head in a sunflower and things like that then you see will this writ large, this spiralling process and if you look closely there are actually three spirals. That is the physical effect of packing objects in space, and then as they grow they just occupy more and more space, as they grow they get larger and larger and it generates that twisting process. In pine cones and sunflower seeds, if you were to carefully count the spirals, there would be a certain number of them. Sunflowers have 34 spirals that spiral in one direction and then 55 spirals that spiral in the other direction, there are flowers that have petals with 34 petals on them or 55 petals on them and so on and on, pineapple segments have 5, 8, 13 or 21, the petals of flowers 13,21, 34, 55. Now anyone that might be familiar with those numbers knows I’m actually now talking about the Fibonacci sequence of numbers which starts at 0,1 , 1, 2, 3, 5, 8, 13, 21, 34 . . . and basically all you’re doing is adding the previous two numbers to get the next number. These numbers that we have been talking about in terms of the leaves, the petals and the process of phyllotaxis – the spiraling process, they are all expressed in nature, and the Fibonacci numbers link with phyllotaxis and with Phi because if you take any pair of these numbers so if you take the first two 1 over 1 equals 1, and if we take 2 over 1 equals 2, 3 over 2 equals 1.5 ad so on and so on, by the time you get to 984, which is a Fibonacci number divided by 610 which is the previous Fibonacci number you get 1.61803389887………. which is that (indicates Phi on diagram), and as these numbers keep expressing themselves and keep getting larger and larger and closer and closer to infinity then this number expresses itself to a greater number of decimal places accurate to Phi and because it is an irrational number it will never actually settle down. And on a graph this process expresses itself as – if that is Phi then the first one is 1, then it’s less than, then it’s greater than, then it’s less than, then it’s greater than . . . . then each pair of numbers will be higher than or smaller than the actual Phi number and that will just keep happening all the way to infinity and it just means that is getting ever closer and closer and closer but by definition this number is irrational and it will never stop it will never settle down because each pair of numbers is slightly inaccurate. So we have then the link to Phyllotaxis using the numbers of the Fibonacci sequence and this generates something strange which is known as the divergent angle. The divergent angle is 137.5 degrees. That expresses itself in most plants, most trees, the ones that don’t tend to express this in the same way are grasses and they grow slightly differently. But if you imagine a tree, and that’s it’s tree trunk seen from above and we say that it’s first branch comes out at 12 o clock, the second branch doesn’t come out at 3 o clock or 6 o clock or 9 o clock, it comes out somewhere aroundhalf past 5, and then its next branch comes out somewhere around there ?? and this angle will be the same as this angle and then this angle for the next branch will be here and it’s the same angle. What that means is there are eight branches in a spiral before the first branch is fully shaded by the next branch above.